KexWorks | Online Tip: What is Pinterest and How Do you Use It? 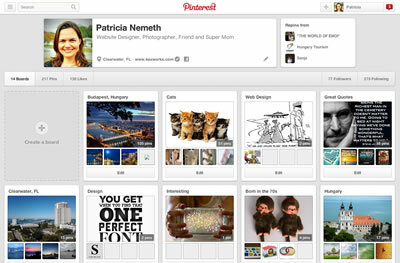 18 Jun Online Tip: What is Pinterest and How Do you Use It? Last week we explained the ins and outs of Instagram, the photo-sharing social media site. Pinterest is another way to share photos, but it is much more than that. In essence, Pinterest is a digital bulletin board on which you can “pin” pictures and links that you find interesting. You can create your own collections, such as “Gardening” or “Good Books” or “Arts and Crafts”. Later, when you are searching for landscaping ideas or trying to remember a good book to read, you can view your boards and even return to the webpages that the photos link to. Pinterest theme-based boards encompass a variety of topics such as events, hobbies, interests and more. Additionally, you can view others’ pins and you can like them or even re-pin them to your own boards. Pinterest allows users to connect through the things they are interested in. Like Instagram, Pinterest is one of the fasted growing social media sites in the world. Many think of it as a combination of Facebook and Twitter, which allows you to have many followers to share your interests with. Pinterest is not as effective as Instagram, but it does have its own advantages. There are a number of things you can do to make the most of your Pinterest experience. Take the time you need. Just because you have signed up does not mean that others are interested or even aware of you. Spend the time to build a good profile, as this will establish you as a profile that posts valuable pins. Prove to your followers that you are an important and reliable information source. Promote others. Although your instinct may be to post only products that you sell, this is the opposite of what you should be doing. In order for your Pinerest profile to become popular, you must pin tips, products and interesting news from other companies. If you continue to drive only your own products, Pinterest users will eventually wise up and opt out. Marry up online with offline. Be sure to draw a connecting line between your online profile and the offline location. If you have a store, for example, you may want to include some ads on the walls for your Pinterest profile. Be observant. It is especially important to follow the going concerns on Pinterest and learn from them. If they seem to be doing something with a specific strategy, emulate them if it fits with your audience. Make sure Pinterest is a good fit for you. Some companies simply are not suited for Pinterest. Learn the ropes, get a feel for the audiences that are there, but if you think it is not worth your time then focus on something else. Have you heard of Pinstagram? This is a fairly new service that allows you to use and enjoy Instagram on the web and makes it easy to share your photos on Pinterest. Since both sites deal with photographs, Pinstagram is an ingenious combination of both Instagram and Pinterest, so you get the best of both worlds!